Name badges are must-haves for guests at networking events and conferences. Being able to identify a person by name, and the organisation they represent, is vital for easy introductions amongst attendees. When names on badges can be clearly seen from a few metres away, you’re creating a better opportunity for your guests to connect with each other and your event to be a success. If you’re hosting a business event, name badges should be at the top of the ‘to do’ list. Managing those name badges at the time of your event is another thing entirely. Here’s a few quick tips to ensure guests aren’t stuck in queues before your event. There’s nothing worse than having a guest’s name or organisation spelled incorrectly on a name badge. Make sure you request the information during event confirmation procedures. Don’t confuse people with too much information on a name badge. The guest’s name, position, and organisation is perfect. If guests want to further their conversations, business cards that contain contact information can be exchanged. 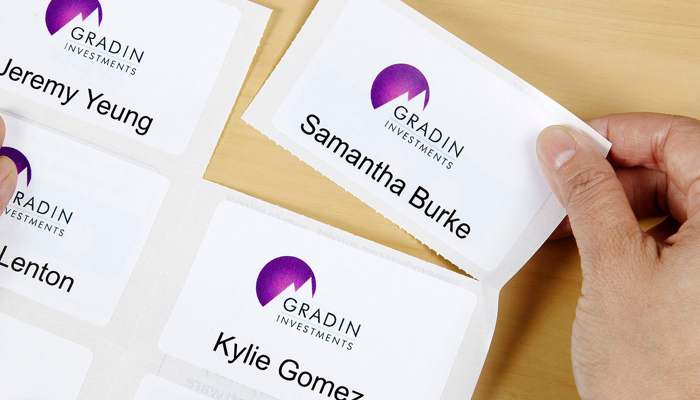 Make picking up name badges at events easy for guests. Arrange name badges alphabetically and if there’s more than 50 guests, consider having two tables on either side of the entrance to move guests through to the event promptly. Have spare name badges ready! There may be guests who didn’t complete the formal registration process – make blank badges available which can be edited quickly. Name badges aren’t just for business event guests. Exhibitors at expos must ensure they have a name badge or have one made available to them by expo hosts. A US study revealed how important it is to recognise a person by name when conducting business. 76% of respondents noted that they trusted and considered the company more professional if staff were wearing name badges. What type of name badge? Anyone who has attended a conference or networking session knows how pesky name badges can be. Sticker name badges can fall off soon after being stuck fabrics, while more formal badges with safety pins can take forever to attach. Lanyards might be great if you need to get back stage at a concert, but in a business setting can tangle with a wearer’s fashion and even flip around and hide the name badge, making it obsolete. Choosing an appropriate type of name badge is a headache event producers can do without! Avery® Fabric Name Badge Labels are a convenient and innovative new way to create printed or handwritten name badges for your next conference or event. They feature improved flexibility so they move freely with the wearer’s clothing but stick securely without curling or falling off. Importantly, they can be removed easily without leaving residue. Ensure you and your guests get the most out of your business event. Mega Office Supplies has what you need to create professional, easy to read name badges that will make the right impression.